Whilst extremely tall cyclists, with very high handlebars, may be able to use this 45 degree accessory bar in an inverted position on their 1 1/8 fork steerers (Replaces a few headset spacers); its intended use is at the rear of the bike, as a support for Brooks saddle bags. Cyclists with legs longer than 31" using 26"wheels (or longer than 32" with 700 wheels) will find that this accessory bar provides attachment points at the correct height for the leather straps of the Brooks bag. 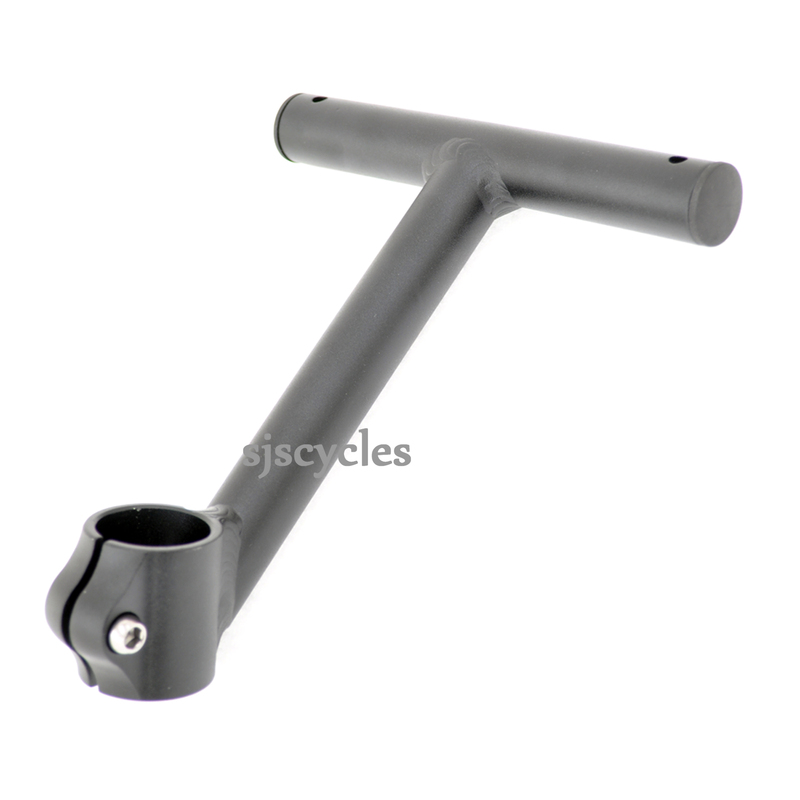 This bar allows the use of a saddlebag on bikes without saddles which have bag loops. This accessory bar does not cut through the leather straps as bag loops tend to do. The holes which are provided allow M5 screws to be inserted, which will prevent the straps from sliding off. We used 2 M5 x 30mm stainless bolts, 4 washers, 2 on each bolt and 2 dome nuts. You will need to put a M5 drill through the holes to make hole throught the end plug for the bolt. ConsToo wide, without hacksawing the T-bar down. ProsSimple, robust, and infinitely adaptable. I'm using this as a great, and sturdy, light mount. It was too wide, but nothing a few minutes with a hacksaw wouldn't fix. Please confirm the seatpost you have. This will fit a 28.6mm, or smaller with a shim. What Is The Overall Length Of The T Section? I would like to use this, inverted, as a light mount on a recumbent trike. Though I'm concerned it may interfere with the cranks, on the pedal boom, as it looks quite wide. The extension bar is 160mm wide. Will It Fit 27.2 Mm. Seat Post? Will It Need A Shim? Thanks In Advance. The fitting comes as standard as 1 1/8" which is 28.6mm so you will require a shim to fit it to your 27.2mm seat post I'm afraid.